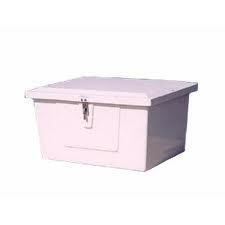 Fiberglass Outside Storage Boxes are ideal for use at home or business. Stainless steel cable stays and lockable stainless latches. Average 3/16" thickness strong, sandwich - core bench - like lid design. Gas spring lifts on 60" & 72" lengths.